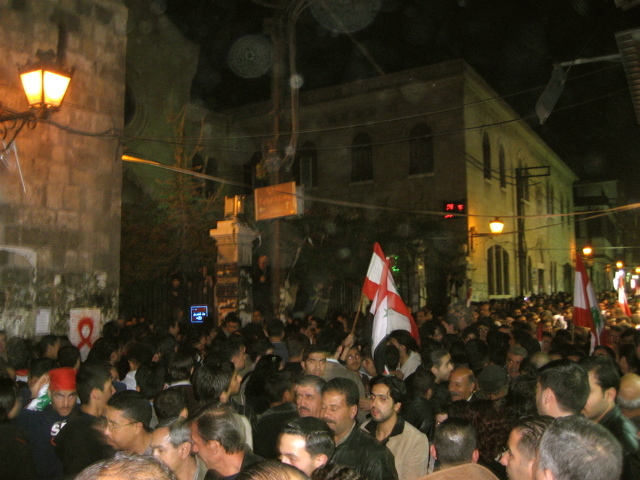 This evening Bab Touma street was a awash with people waving Lebanese (and some Syrian) flags, singing songs of welcome, generally pushing and packing from the traffic circle near the original gate to the Maronite church a few hundred meters into the Old City. Michel Aoun was in town, or so we had heard. Originally word was out that there would be a demonstration/welcome of some sort near Souq al-Hamidiyeh. Two of us wandered through and nothing was unusual; so instead we bought some pistachio-flaked ice cream from Bakdash. It turned out Aoun would be visiting the Maronite church on Sharia Bab Touma. The crowds were there. A television crew from Syria One was interviewing a selection of people; crowds of young Syrian boys poked their heads into the camera lighting, trying to get on tv. 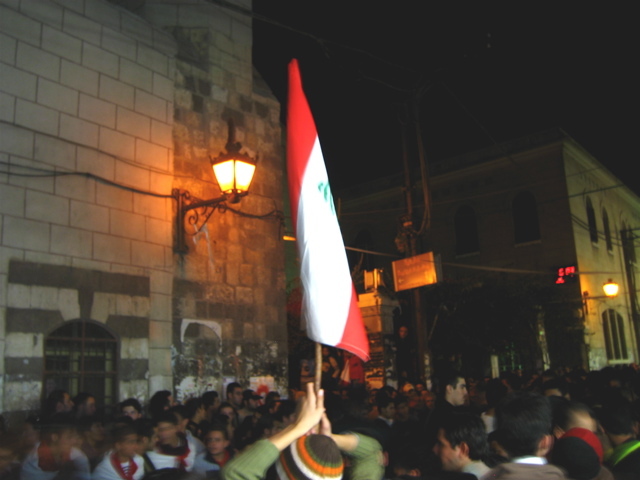 The street was lined with Lebanese flag banners; there were various security details — none very formal — handing out flags. 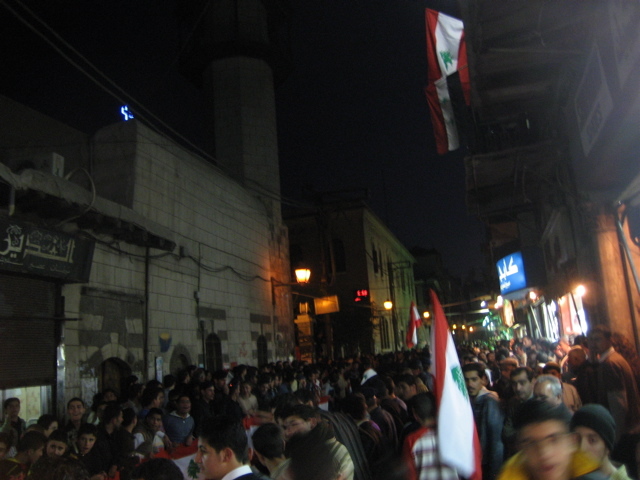 Children and teenagers were chanting songs, welcoming Michel Aoun to Syria and singing their solidarity with Hezbollah (curious most of all, in the Christian Quarter of the Old City). The actual arrival was a sea of pushing. The lights of the camera crew were the only indication that Aoun was pushing through the crowds and into the church. It was a remarkably packed place for a political visit. I would have imagined that the street would be cleared, that police would line the storefronts. Instead it was all flags and signing, with the odd sighting of starlet-looking folks who we assumed were selected Lebanese visitors, part of Aoun’s entourage. My camera battery chose to die before I snapped a few shaky pictures of the crowd just after sunset. We didn’t linger long enough to see Aoun leave the church; maybe he left out the back. You couldn’t siege a traffic circle today. 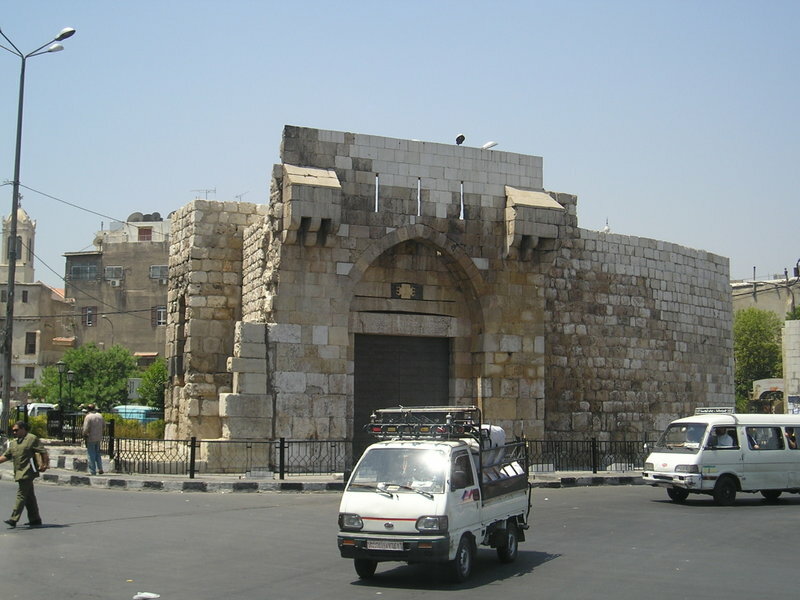 The remnants of the Byzantine forces now withdrew to Damascus. The Muslims pursued them. 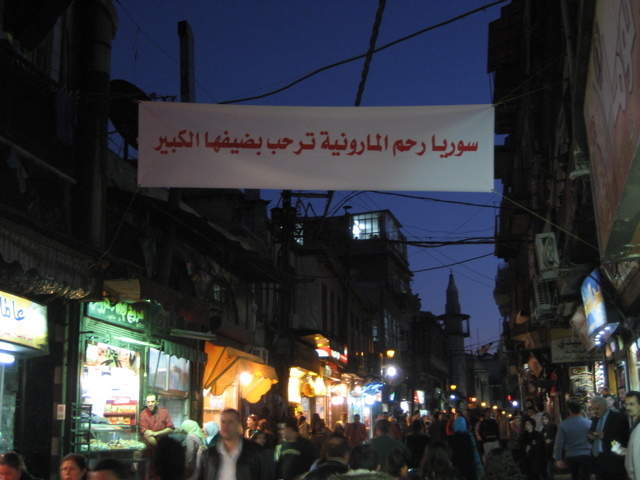 The siege of Damascus became one of the set pieces of the conquest of Syria. To a remarkable extent we can retrace the progress of the siege because of the detailed descriptions of the sources and the preservation of the fabric of the city. The walls of old Damascus, Roman or earlier in origin and continually restored since, are still largely intact. Only at the western end where the city expanded in Ottoman times is the old circuit breached. 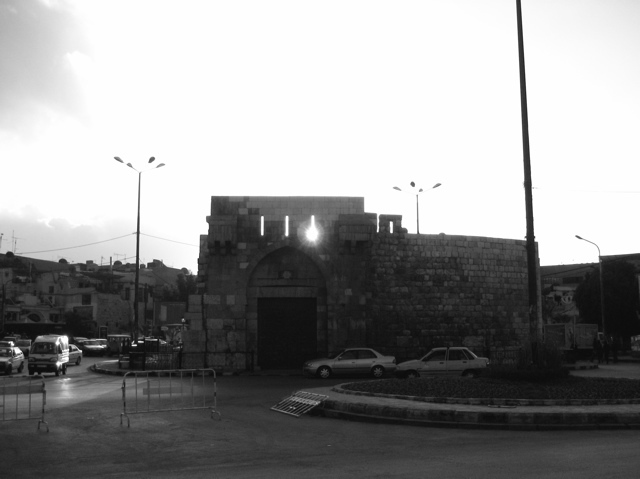 All except one of the ancient gates survive and they bear the same names today as they do in the early Arabic sources: it is an astonishing example of the continuity of urban geography and architecture through almost fourteen centuries We are told that Khalid b. al-Walid was stationed at the East Gate (Bab Sharqi), Amr b. al-As at St. Thomas’s Gate (Bab Tuma), Abu Ubayda at the now demolished Jabiya Gate on the west side and Yazid b. Abi Sufyan at the Little Gate and Kaysan Gate on the south side. Hugh Kennedy, The Great Arab Conquests, 79. 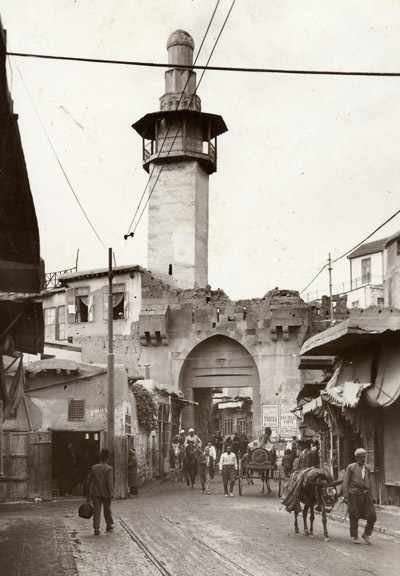 Bab Touma, the Gate of St. Thomas, in an undated photograph from MidEastImage; an excellent source for the way things were, or at least how they looked. Today it’s Sahat Bab Touma; a traffic circle.